Boekhoute was first mentioned in 1018 when it was part of the City and Corporation of Bouchaute "de Stede ende Ambachte van Bouchaute". Together with the other three corporations, Assenede, Axel and Hulst it lay on the border of the Westerscheldt. Weverswale, Koudekerke, Perenboom, Ter Piete, Boterzande, Bassevelde and Oosteeklo were also part of this group. The Corporations were held in feudal tenure by the Dukes of Flanders for the German Emperors and not for the King of France. to the courage of its fisherman. The Corporation of Boekhoute was very badly hit by the terrible floods and inundations of 1375-76 which is when the Braakman was formed or greatly extended. The Braakman was a huge bay in the Westerscheld. Our ancestors suffered terribly from the great storms and floods of the 15th Century. The year 1404 for instance was a year long remembered for its inundations. Koudekerke and Weverswale were two of the villages that disappeared for ever without a trace. The great dikes now are the silent witnesses of the struggle of our ancestors against the sea. The Vernouden dike was perhaps the oldest: we found it mentioned first in 1325. Another very old dam is the Gravejansdijk (Duke John's Dike). This dike cuts Boukhoute in two: on one side there is the "Houtland" (Woodland) so called because of the wooded borders of the fields. On the other side there are the Polders, great tracts of good agricultural land reclaimed from the sea. 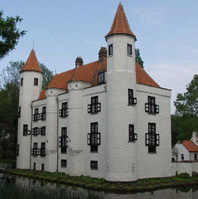 In the 16th Century Boekhoute was hit by an outbreak of the plague and in 1530 several floods were the cause of great poverty in many families. Shortly after that there were the religious conflicts: the protestant movement was gaining ground and many protestants fled north into what is now the Netherlands. Gangs of "Geuzen" were about, terrorizing and plundering. The word "Geus" (plural "Geuzen") meant beggar, protestant. Classified as a monument since 1977. Boekhoute was under the ecclesiastical jurisdiction of the bishopric of Utrecht but from 1561 onwards it came under the newly established diocese of Ghent. Then a new border was set up and Boekhoute, now a border town, was attacked by gangs of lawless mercenaries. In 1587 a fortress was built in the port to counter these gangs. The reign of Albrecht (Albert) and Isabella brought a short respite and several names such as the Isabella-polder testify to this but peace was not to last and before long Boekhoute was the theater of fights between Dutch, Spanish and later also French soldiers. In 1690 the Dutch closed off the port and the fishers were allowed out only after Boekhoute had agreed to pay an annual toll to the town of Philippine. 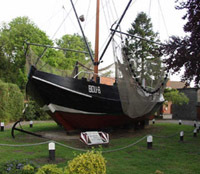 Boekhoute is more than 1600 hectares and in 1698 there were almost 1000 inhabitants. This didn't increase much over the next hundred years and in 1801 it stood at 1175 but in 1820 the total population was 1766 and in 1846 it was 2364. And the population remained at approximately that level until in the 1970s it began to go down slowly here and in other similar rural villages. 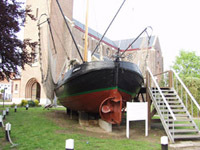 In the past Boekhoute was an important fishing port. But the silting up of the gully which had been resisted for so many years was unstoppable. In November 1784 the Dutch army closed the sea lock near the fortress of Philippine and much of Boekhoute was inundated. Many years later the fishermen of Boekhoute again (or still?) had to put up with red tape and administrative sabotage by the Dutch. During the First World War the fishermen were not allowed to set foot in the Netherlands which remained neutral during that war: this meant they didn't put to sea for more than 4 years. The mussel banks in the Westerscheldt and in the Braakman disappeared due to the construction of successive dikes and the changes in the water levels. This meant the fishermen finally had to content themselves with the harvesting of shrimp. In 1952 a great dam finally closed the Braakman which thus became a lake. It was a very effective protection against the sea and Boekhoute was not inundated in the terrible spring-tide and inundation of 1 February 1953 which ravaged much of Zeeland so badly. Of course that dike also meant the end of the port of Boekhoute. Until 1923 Boekhoute had a very tall windmill. It was a tower mill called "Oostmolen" (East Mill). It had been built in 1867 to replace an age old post mill. It belonged to the Ego family. They were bakers. On Thursday 17 March 1881 a fatal accident happened: workmen were carrying out repairs on the stage, the wooden platform around the mill. One of them, a twenty-one year old from Tielt, received a blow from one of the sails. In 1910 the mill came into the hands of the Matthijs family. They were millers. In 1923 the tower mill was demolished and replaced with a mill powered by a gas engine that was later replaced with an electrical engine. In 1976 Boekhoute was merged into Assenede together with Bassevelde, Oosteeklo and Assenede itself. We are indebted for much of the above to Mr. Henk Van den Fonteyne. Here we have a few pictures taken between 1962 and 1975 in Boekhoute by Romano Tondat.